Laurence Teillet is a French multi disciplinary designer who works and lives in London. 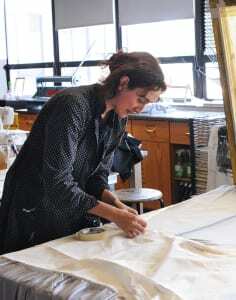 She studied Fashion Design and Environment at Duperré, Ecole Supérieure des Arts Appliqués in Paris, and Textile Design in London where she developed a Design Manifesto to Re-use second hand textiles for her Master of Arts degree at Central Saint Martins (UAL). Laurence produced a range of re-used textile designs through inventive printing techniques for Atom Design Studio in London. The Garment Party Happening, her conceptual and experimental work in progress about how to wear and use clothes in different ways, led to creative collaborations with Fashion Professionals and Art Institutions such as Selfridges in London, Upside down – Inside out Exhibition in Copenhagen, ELLE Magazine & Licence and Edelkoort Studio in Paris. She is leading experimental Masterclasses in Art Schools and Museums in France, USA and Canada, to transmit her experience, share her creativity and the importance of responsible design in Fashion and Textiles. This is an excellent opportunity to work with students, designers and professionals to develop their creative potential and gain a deeper understanding of sustainable alternatives for the contemporain fashion and textile industry. Desiging with a conscience, being responsible and ressourceful to contribute to a better world. We learnt how to make a 'hobo' bag using vintage fabrics.The teachers were both very skilled and helpful.Brilliant venue with plenty of light and space - near to the fashionable Broadway market.My husband who had never used a sewing machine came home with a beautiful bag and was so happy - thanks ladies. I am very pleased with the experience. It was intense for a beginner like myself but the learning process was smooth, explained carefully and kindly. Laurence was very helpful and patient. We work through all the process from choosing our colours and patterns from second hand materials to completing the piece. This involved measuring, cutting, ironing, preparing folds, adjusting the sowing machine to the thickness of the material we chose, feeding the sowing machine with the chosen colour thread, and of course sowing. Each stage were well explained and demonstrated by Aurore or Laurence. I came out of the workshop tired but proud and happy of my achievements. More over I left with new knowledge tested and I believe I can now engaged in more complex designs. Hopefully Laurence will decide to open a new workshop on how to draw designs and patterns whith in mind the zero-waste principles! The workshop was brilliant! 2 teachers taking us through the make of a very ‘couture’ tote bag, large size, made of 3 recup vintage fabrics supplied at the workshop. The bag includes large folded exterior pockets, it is super practical and stylish. People have stopped me on the street several time already to find out where it came from! Would love to attend the 0 waste dress workshop next! I learnt how to make a unique bag! A bag I feel very proud of today :) The teachers presented their previous and impressive achievements in the fashion industry and explained their approach well. They were very helpful and respectful of my creative choices. i felt supported every single time I needed extra help. The venue was great and we were made to feel more than welcome. I would recommend this workshop to anybody interested in exploring contemporary fashion and making something unique and beautiful. II have learned how to choose different fabric to use, to sew with the machine, and more. Both teachers were very helpful and savvy. Friendly and warm atmosphere as well.